The thing about Steven Spielberg’s 1993 blockbuster Jurassic Park, aside from it being a hugely enjoyable and technologically groundbreaking piece of cinema for its day (and, to be honest, it still is when you compare it to some of today’s blockbusters), is that it was pure lightning in a bottle. The idea of a dinosaur theme park was such a great one that it was no surprise that audiences and critics embraced it as much as they did, but when you try and replicate that movie magic in several inferior sequels, suddenly the idea and its initial impact has a lot less of an excitement factor; hence why all of the Jurassic Park sequels, from the deathly dull The Lost World: Jurassic Park to the amusingly dumb Jurassic Park III to the hugely disappointing (and somewhat sexist) Jurassic World, have all failed to live up to the heights established by the series originator. The trend of bland sequels to such an awesome movie continues with Jurassic World: Fallen Kingdom, which is so middle-of-the-road and instantly forgettable that it’s honestly hard to even conjure an emotional reaction to it like any of the other sequels. Set a few years after the events of Jurassic World, the titular theme park has been abandoned and the cloned dinosaurs have been left to roam the island of their own free will. 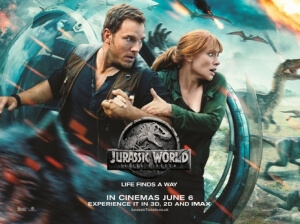 However, the island’s once-dormant volcano has suddenly become active, and all prehistoric life that remains is threatened, but not if former Jurassic World employee and now dinosaur rights activist Claire (Bryce Dallas Howard) can help it, and soon she and her ex-boyfriend, former dinosaur trainer Owen (Chris Pratt), are recruited to fly to the island and rescue as many dinosaurs as they can. This being a universe where humanity is a bigger monster than the actual monsters (not to mention the fact that the trailer pretty much gives it all away, in a Terminator Genisys kind of situation), they are soon double-crossed and left to watch as the dinosaurs are captured and taken to the mainland, where they are each being auctioned off to the highest bidder. Now, it becomes a mission to save the dinosaurs from their current predicament, and subsequently the film becomes an extended remake of the climax to The Lost World (in the sense that the dinosaurs have started to roam on human territory). This is a film that you can tell is trying to atone for some of the common criticisms of Jurassic World, such as the cast of shrill and uninteresting lead characters as well as the distractingly inferior CGI (not to mention the fact that Bryce Dallas Howard ran in high heels for the entire movie), and the hiring of director J.A. Bayona over previous director Colin Trevorrow (who returns here in a co-writing capacity, but is scheduled to return as director for the next instalment) is certainly a step in the right direction, least of all because he’s just a stronger director than Trevorrow is. However, none of that amounts to a film that’s even remotely as entertaining as some of the other Jurassic Park sequels; quality of those movies aside, at least they knew when to be fun at the right moments, whereas this movie is largely bereft of any truly awe-inspiring moments that made the series a memorable one to begin with. In terms of pure entertainment, it’s much more of a slog than even Jurassic World was, because it tends to take its themes and science far too seriously, when the idea of dinosaurs roaming about in this day and age is really all you need to make a movie fun and enjoyable. It tries to be smarter than the average Jurassic sequel, and God bless it for trying, but there are still plenty of stupid B-movie moments that the film just can’t shake off to save itself. For instance, there are characters who show up to be exactly who you think they’re going to be in this kind of film, whether it’s the irritating comic relief – that would be Justice Smith, doing his best impression of Shia LaBeouf in the Transformers movies as the dweeby computer hacker brought on board – or mere appetizers for the dinosaurs to munch on (I won’t say who, but you’ll know the ones when you meet them). There are plenty of dumb things that they and other characters do that result in so much bad stuff happening, that you honestly pity the dinosaurs sometimes for co-existing alongside a species of purebred idiots; I am curious to see what other people make of these dumb decisions when they see the film, and if they’ll find it as silly as that whole high heels things from the last one. There’s even a last-minute revelation about a certain character that kind of comes out of nowhere, and it’s never really elaborated on after that specific moment in lieu of everything else that’s going on, which makes it odd that they would introduce such a new concept only to go absolutely nowhere with it. I guess if you’re the kind of movie-goer who’s a bit more forgiving of this franchise and its many flaws, you might go into Jurassic World: Fallen Kingdom with a fair mind about it. Don’t, however, go in expecting another thrill-ride that the last film ended up being for so many people, because this one is a lot less engaging and exciting than it needs to be, and while it’s probably a better-directed film than Jurassic World was – because, again, J.A. Bayona is a much better director than Colin Trevorrow anyway – that doesn’t automatically make it the kind of fun and entertaining blockbuster that it should be. If things don’t pick up for this franchise soon, the way that it’s going right now, it’ll become extinct before you know it. Jurassic World: Fallen Kingdom tries to be better and smarter than the middling previous instalment, but it ends up being a lot less fun and enjoyable ride than some of the other sequels, as it takes itself far too seriously while still containing some extremely dumb moments that don’t work for the kind of film they were trying to make here.